From the M48 westbound, you need to leave at J1 and turn right at the roundabout. From the M48 eastbound, you need to leave at J1 and turn left at the roundabout. From the M4 westbound, you need to leave at J21 to join the M48, and then leave at the next junction (J1). 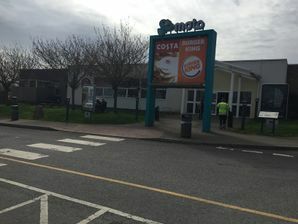 Turn right at the roundabout to enter the services. From the M4 eastbound, you need to leave at J23 to join the M48 and then follow the road until the second exit (J1). Turn left at the roundabout to enter the services.